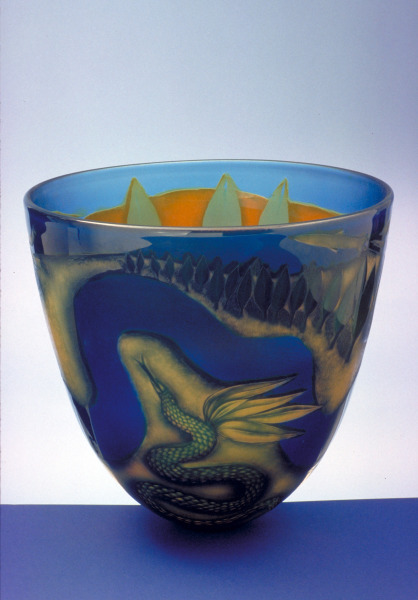 Glass vessel, cased with colours using overlays, depicting a landscape and a snake-like creature. Blown by Neil Wilkin, Torrington Devon, and cased with colours using the Swedish technique of overlay. 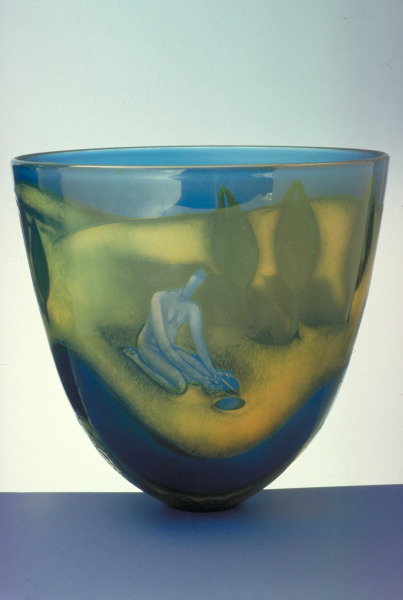 When cool, images engraved by Henshaw, removing the colours from the inside and outside to reveal each individual colour. Flexible-drive engraver is used, with stone and diamond wheels; areas are also sandblasted to provide a rich and varied surface texture. Each piece is polished using a lathe with cork and felt wheels. Glass is a fluid material. Even when cooled and in "solid" form, it is constantly moving. Behaving as does a liquid, it demonstrates that despite the outward appearance of things, all is temporal and transitory. 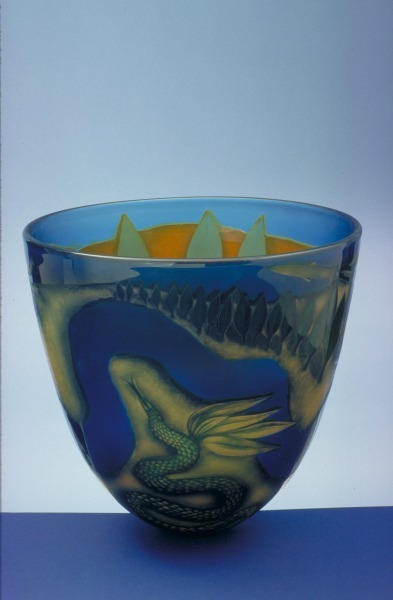 Thus, for me, the medium of glass is a visible expression of the flow of life. In the act of drawing and engraving an image, I aim to express the life and dynamism of that image; to depict matter as change. The image represent aspects of life, both dreamed and imagined. Archetypal figures and themes occur and reoccur throughout the work. The river, bridge, Kings, Angels and the Trickster present themselves there. Springing from the content of the unconscious, the images themelves project the contents of the consciousness of the world. My objective is to ascribe consciousness to every expression of nature. With the discovery of our imaginative possibilities we may participate in the imagination of the world. Entering a great cyclic flow of life, each thing - however small, is an essential participant totally interdependent on all other things. In the act of drawing and engraving an image, I aim to express the life and dynamism of that image; to depict matter as change. The images represent aspects of life, both dreamed and imagined. Archetypal figures and themes occur and reoccur throughout the work. The river, bridge, Kings, Angels and the Trickster present themselves there. Springing from the contents of the unconscious, the images themselves project the contents of the consciousness of the World. My objective is to ascribe consciousness to every expression of nature. With the discovery of our own imaginative possibilities we may participate in the imagination of the world. Entering a great cyclic flow of life, each thing - however small is an essential participant totally interdependent on all other things. The pieces are free blown by Neil Wilkin, and cased with colours using the Swedish technique of 'Overlay'. When cool, I engrave the images, removing colours from the inside and outside to reveal each individual colour. This technique is similar to cameo work. I use a flexible drive engraver with stone and diamond wheels. Areas are also sandblasted to provide a rich and varied surface texture.